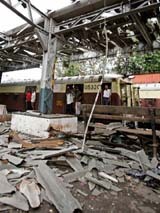 The day after seven serial bomb blasts on Mumbai's local trains Tuesday claimed 190 lives, the city bounced back with life returning to near normal. Declaring that "no one can make India kneel," Prime Minister Manmohan Singh assured the nation that "we will win this war against terror and nothing will break our resolve." Were Mumbai bomb blasts an intelligence failure? Security and intelligence experts monitoring terrorist -related activity in the country here see a lot of similarities between the Mumbai serial bomb blasts and the pre-Divali blasts which ripped through several congested markets in the Capital last year, implying that the same group could be behind both incidents of serial blasts. The BSE Sensex today zoomed up by 315.74 to close at 10,930.09 on the sentiment of impressive result of IT bellwether Infosys Technologies, brokers said. They stated it was widely expected that the market would drift down to lower levels today following a series of explosions that shook Mumbai yesterday evening. The septuagenarian parents of a senior IAS officer of the Maharashtra cadre, Dr Amar Singh, were brutally killed at their house, a few yards from the police station, in this border town in the wee hours here today. 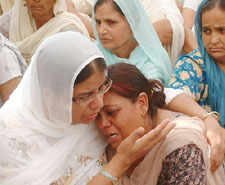 After a discussion with the Chief Secretary and other senior officers concerned, the Cabinet Subcommittee headed by the Rural Development Minister, Mr Lal Singh, today made a recommendation that along with debt-ridden farmers, those who got loans from the Punjab Backward Classes Finance Corporation and the Punjab Scheduled Castes Finance Corporation should also be given relief on the pattern of farmers.